Mainely Write: Poetry Friday Here, Here! 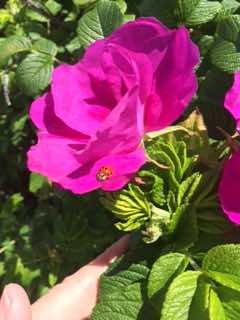 So speaking of roses and sweet, my poem for today is about the beach rose - Rosa Rugosa - that can be found along roadsides and along beaches here in Maine. They are the absolute best smelling rose ever! There's nothing like them for filling the air and surprising you with their sweet aroma as you pass by. I have some roses given to us in memory of my parents, and from our church when we moved. And after writing and posting the poem, I realized I'd also incorporated my One Little Word "Reach" in the poem, too! The area in front of my house where we planted three rosa rugosas, is being taken over by new roses sprouting up all around the originals. I laid stone around the area a couple of years ago, and there are new shoots coming up between the stones. As beautiful as these roses are, they are a bit intrusive. I am researching how to transplant some, so they can go with us to Friendship and so that my daughter and son can take some to their homes, too. Though they are very hardy and resourceful when left to themselves, I have not been successful at transplanting any yet! Gotcha covered! Yours is up there now! Cape cod a few summers ago, they are lovely! Hope you figure out the transplanting part, some plants just like to move around on their own and don't like it when we intervene … Thanks for hosting Poetry Friday! Thanks for hosting and sharing your rugged little rose! I'm interested to see how the Padlet works! Maybe our friends on other continents will have good luck with it! Good luck with your transplantation! I love flowers with sweet scents :-) Thanks for hosting us. The padlet is a nice option. Donna, thanks for hosting. What a lovely poem, and the Padlet worked for me -- hope it makes things easy for others, too. I like the wordplay here, Donna! Beach roses and Maine just go together in my mind. oh, my goodness! I LOVE the use of padlet for Poetry Friday. Consider this idea taken. I read your Thursday Spiritual Journey post and somehow I find that really fitting with the Rosa Ragosas poem. Congrats on a successful use of the word REACH. Thanks for hosting this week. I hope you have as much fun as I did last week reading everyone's posts. I got it to work but it kept coming up anonymous for some reason. Doesn't matter, the link works! I love your roses, and wonder why they won't transplant well? And I love what seems the "underlying" tribute to your, or any, mother, mustered family, claimed more beach! Feels good to me! Thanks for hosting! Nice rhymes, Donna. Your roses look beautiful and sound like they have as much sentiment as scent. I hope you find a way to transplant them. I've only ever seen roses sold in pots, with roots and woody stems. "And claimed...More beach" That's perfect, Donna. I need more beach in my life right now! Thanks for hosting! I love the rhythm of your poem. Not too sure how to transplant. I just successfully managed to sprout an avocado seed. I was planning on transplanting it this weekend. Last night it decided die! Boo. Time to start over. Is the water always cold on the beaches in Maine? How did you get the roses?? Did you take a cutting, a root, a hip? The neat thing you discovered about this rose is that it is VERY hardy! Cutting it down is not the way to kill it... trying to transplant it is! As Diane said, beaches and roses and Maine just seem to fit together perfectly. Loved the rhythm of your poem. Thanks for hosting today! Love this creatively rhymed tribute to the hardy, fragrant rosa rugosa! One of my favorite things about them is that they bloom multiple times each summer and fill the air with their heady scent. The combination of beaches and roses is also a delight. Good luck transplanting and thanks for hosting this week! I love the spirit of your personified rosa rugosas. So determined. Brilliant use of Padlet for the roundup! You've claimed a bit more beach for us! Beach roses! Why have I never heard of these? Your poem introduces them to me beautifully---and I especially loved your use of "clustered/mustered" which hints at their fighting spirit. Thank you for hosting today! Thanks for hosting! I got my link to post, and I'll be back later in the day to read what others posted! Donna, thanks for hosting the roundup this week. And thanks to the Poetry Princesses for their "Statues in the Park" poems. The challenge brought to mind an old poem that I wrote more than thirty years ago. Thanks heavens my long term memory hasn't failed me yet! Beautiful, Donna! We spent our summers in Rhode Island when I was a kid, and the beach roses are everywhere. Thank you for hosting today, and sharing the bounty of your roses with us! Donna, I finally got a chance to finish my post and poem that I started last week. Time flies in the summer when the sunshine draws you outside. I was with my granddaughter last week and I can't tell you how much I love grandmotherhood, just like you said. Thanks for hosting and providing a poem to go along with a rose backstory. I believe that is the rose that we planted on my side yard because my gardener said that it would not need diligent tending. I enjoyed reading your poem and was delightfully surprised by the ending.